Shadow of the Beast is a solid revival of an under-appreciated part of gaming history. It's great to see it exposed to a new audience over 20 years later as it provides a brief, yet exciting journey. When Shadow of the Beast released in 1989 for the Amiga, it was an amazing graphical and technical accomplishment. The platformer’s usage of parallax scrolling was revolutionary, and it was an audiovisual spectacle. After receiving two sequels, Reflections Interactive’s series faded into gaming history. That is, until Heavy Spectrum Entertainment Labs decided to remake Shadow of the Beast and introduce it to a new era of gamers. Considering what a visual showcase the original game was, it’s quite fitting that the 2016 reboot is equally as gorgeous. The melee-focused platformer will wow you immediately, as the opening sequence takes place in a gorgeous hillside filled with plant life. Each level also takes place in vastly different locales, ranging from dangerous deserts to puzzling crypts, so there’s a lot of different environments and creatures to see. While technically a platformer, the real focus here is the game’s unique combat system. All of the action takes place on a 2D plane, and the Beast, who is named Aarbron, can take care of almost every enemy with a single attack (which makes sense when you look at his huge, Wolverine-like claws). The challenge is not simply disposing of individual enemies, but getting rid of huge groups of them in an efficient manner. While exploring each level, you’ll often find yourself in an encounter against 10-15 different enemies. These enemies come from both sides of the player (left and right), so spacing is extremely important. Since the Beast can only take a few hits before succumbing to his attackers, you’ll have to smartly take care of each side, so as to avoid being ganged up on. Aarbron’s default attack is enough to take care of his enemies, but it’s not the only tool at his disposal. He can also stagger enemies, which is extremely useful at stopping the progress of a line of baddies, mantle over enemies to switch positions, and use the blood of his fallen enemies to perform special moves that refill his health. Finally, later in the game the player gets access to a gun that is powered by blood (which is about the most heavy metal weapon ever designed). There’s a lot of depth to the combat, and if you want to get a high score on a stage you’ll have to really master the game’s combo system. The combat initially feels very stiff as the Beast has a short range of attack. While this was initially frustrating, I quickly realized how important it was to the overarching design. Since most of the game’s plentiful difficulty comes from these encounters, it’d be far too easy if he could attack from afar. The deliberate movements of Aarbron’s attacks, and his own individual movements, are things that I eventually came to really appreciate. Most of Shadow of the Beast‘s 7 levels are extremely straightforward, but there were enough hidden extras scattered about to satisfy my itch for exploration. Aarbron can use his claws to climb up walls and there are hidden orbs to be found that unlock special cutscenes which make sense of the game’s narrative. Most of the storytelling is found in these scenes, as the stages tend to focus strictly on action. The story turns out to be one of the strengths of the game, and it’s surprising that it’s seemingly tossed aside. While longtime fans of the series will immediately understand some of what is going on, I had little knowledge during my first playthrough (other than to go to the right and kill whatever got in my way). The dialogue of other creatures is non-comprehensible in-game, as players will have to purchase their dialects between missions to learn their language. 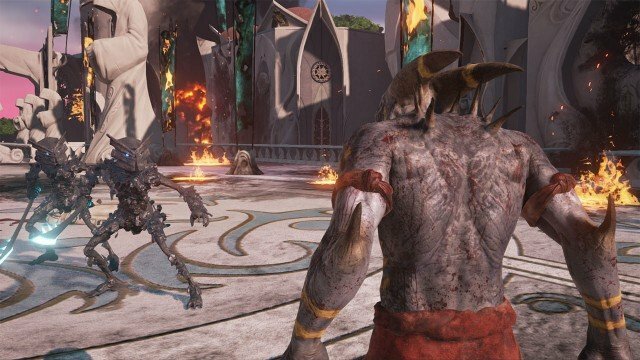 Since Shadow of the Beast is extremely short, it takes only 3-4 hours to beat, though learning the narrative over time actually gives players a reason to replay the levels. The in-game currency players earn from doing well in combat can also be spent to purchase the aforementioned dialects, new skills, and even the 1989 original for the Amiga. It’s awesome that the original game is included here, and Heavy Spectrum has done a good job of realizing that most players won’t find it particularly enjoyable. It’s extremely easy to die, and just not well designed in today’s standards. That’s why it’s great that they’ve also included an invincibility mode, as well as a video playthrough of the game. Also included is a nice retrospective piece on the original trilogy of games, which does a great job of explaining why the series was so impactful at the time. I found myself conflicted about the short length. While I certainly would’ve liked to have seen more levels, especially since the visual design is excellent, I do appreciate how there’s no filler. Every area is vastly different from the rest, and I’m certainly going to enjoy replaying these stages again on other difficulty levels. That said, it’s pretty disappointing to see that one of the best aspects of the game – the story – is hidden behind unlockables. 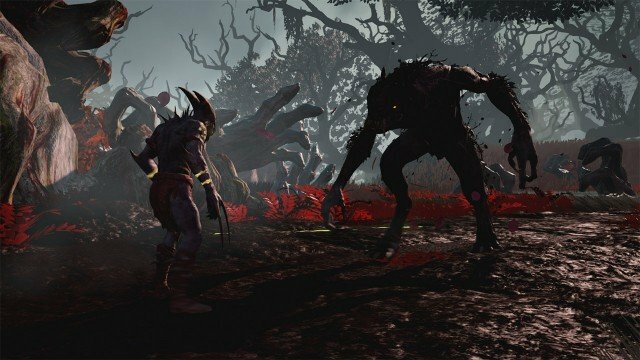 Overall, Heavy Spectrum has done a great job of reviving Shadow of the Beast, even if it doesn’t make the best first impression. 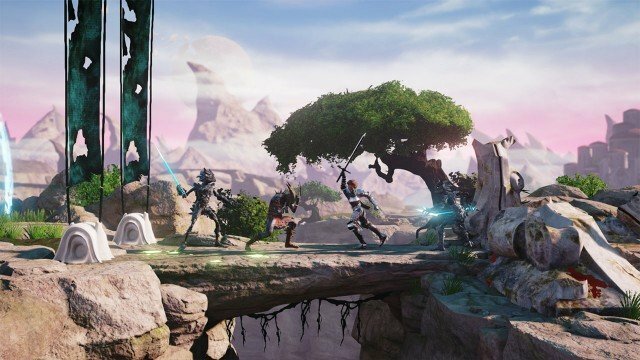 The stiff combat might feel off-putting at the start, but there’s a satisfying level of depth to be found in its unique brand of action. The adventure is over right as it picks up speed, but thankfully there’s plenty of reason to jump right back in. Here’s hoping that gamers won’t have to wait 20 more years to see Aarbron in action again.